Purpose: We retrospectively collected consecutive survival data of lung adenosquamous cell carcinoma (ASC) patients with brain metastasis (BM) in our institute and discussed the factors related to prognosis of these patients. Patients and Methods: A total of 42 patients diagnosed as lung ASC with BM between July 1, 2008 and December 31, 2010 at the Department of Respiratory Medicine, Shanghai Chest Hospital, Shanghai Jiao Tong University were retrospectively reviewed. Time to BM (TTB) and overall survival (OS) data were analyzed. OS1 was calculated from the time ASC was diagnosed until the death of a patient. OS2 was defined as the duration from BM was first identified to the death of a patient. 1-year, 2-year and 3-year survival rates were also computed. Univariate and multivariate survival analysis was performed using Kaplan-Meier methods and Cox regression. Results: The median TTB for all patients was 5.7 months [95% confidence interval (CI): 0.8 - 10.6 months]. The median OS1 was 13.8 months (95%CI: 11.2 - 16.4 months). TTB longer than 12 months [adjusted HR: 0.15 (95%CI: 0.05 -0.48 vs. TTB≤ 6 months, P=0.001); 0.22 (95%CI: 0.07- 0.71, vs. TTB 6-12 months, P=0.010) and resection for BM lesions [adjusted hazard ratio (HR): 0.47 (95%CI: 0.24 - 0.94 vs. not resected, P=0.032)] were independent predictors for a longer OS1. The median OS2 was 7.9 months (95%CI: 4.5 - 11.3 months). Treatment cycles more than 3 [adjusted HR: 0.41 (95%CI: 0.20 - 0.83 vs. treatment cycles <3, P=0.013)] was an independent predictor for a longer OS2. Conclusions: This study shows that resection of BM if possible, and standard chemo-radiotherapy in patients with multiple BM lesions is associated with longer overall survival. Keywords: lung cancer, non-small-cell lung cancer (NSCLC), lung adenosquamous carcinoma (ASC), survival, brain metastasis (BM). Existed evidence have revealed that ASC is an extremely aggressive subtype of lung tumors as patients with primary lung ASC had a poorer prognosis compared with those with a pure adenocarcinoma or squamous cell carcinoma subtype [2,7,8]. In recent years, targeted therapies such as epidermal growth factor receptor tyrosine kinase inhibitors (EGFR-TKIs), are playing an increasingly important role in the treatment of advanced non-small-cell lung cancer (NSCLC) patients with sensitive mutations. However, EGFR sensitive mutations are mostly harbored in patients with a pure adenocarcinoma type. For advanced lung ASC, standard platinum-based doublet chemotherapy is the main treatment regimen, which has limited efficacy. Brain metastasis (BM) is a major cause of mortality and morbidity in lung cancer. It has been reported that BM are found in approximately 50% of all lung cancer patients . BM in ASC patients is statistically in greater numbers than in patients with pure adenocarcinoma and squamous patients . To data, the prognosis for primary lung ASC with BM has not yet been analyzed. In this observational study, we retrospectively collected consecutive survival data of ASC patients in our institute and discussed the factors related to their prognosis. A total of 42 patients diagnosed as lung ASC with BM between July 1, 2008 and December 31, 2010 at the Department of Respiratory Medicine, Shanghai Chest Hospital, Shanghai Jiao Tong University, were retrospectively reviewed in this study. These patients were histologically diagnosed as primary lung ASC firstly and occurred BM identified by enhanced magnetic resonance imaging (MRI) of the brain during our study time. All patients were followed to death. Patients who lost to follow-up and had missing survival data were excluded. The main end points of this study were time to BM (TTB), OS1 and OS2. TTB was defined as the time from the date ASC was diagnosed until the date of BM identified according to enhanced MRI examination. OS1 was calculated from the time ASC was diagnosed until the death of a patient. OS2 was defined as the duration from BM was first identified to the death of a patient. The cutoff date for the study was September 1, 2016. Clinical factors including age, gender, tumor differentiations, clinical stages at the time when ASC was diagnosed, time of BM occurrence, BM numbers, BM locations, treatment information for BM, and some biomarker levels including P53, NM23 and vascular endothelial growth factor (VEGF) were collected in the study. Resection for BM included BM resection using stereotactic radiotherapy and surgery methods. This study was approved by the Ethics Committee of Shanghai Chest Hospital, Shanghai Jiao Tong University, Shanghai. As this is an observationally retrospective study, patient consent is not required by the Ethics Committee of Shanghai Chest Hospital, Shanghai Jiao Tong University. All data related to patient were kept confidentiality. Survival data were all presented as “months”. 1-year, 2-year and 3-year survival rates were also computed. All descriptive survival data were presented along with a 95% confidence interval (95%CI). A stacked bar chart was generated to show the relationships among survival data for all cases. Kaplan-Meier methods and log-rank tests were used to analysis OS data and select factors with P-values less than 0.05 in different levels, then a Cox proportional hazards model using Enter method was performed to further identify independent prognostic factors associated with OS. All confidence intervals reported were 2-sided, and P values less than 0.05 were considered statistically significant. All statistical analyses and figure generation were performed using SPSS® software, version 13.0 (SPSS Inc., Chicago, IL, USA). The demographic and clinical characteristics of the 42 ASC patients are shown in Table 1. These patients tended to be young (< 60 years), male gender, and had low differentiated tumors. BM lesions were found to be more prevalent in cerebrum. Single BM lesion was more common than multiple metastases in these patients when they were first identified to occur BM. In addition, 29 patients were identified to occur BM during treatment, while 13 occurred BM at the time when ASC was diagnosed. The median TTB was 5.7 months (95%CI: 0.8 - 10.6 months). All patients died in this study. The relationships of survival data TTB, OS1 and OS2 for all patients are shown in Figure 1. The median OS1 was 13.8 months (95%CI: 11.2 - 16.4 months, Figure 2A). When initial event was calculated from the time ASC was first diagnosed, the 1-year, 2-year and 3-year survival rates for ASC patients were 61.9% (26/42; 95%CI: 47.2% - 76.6%), 26.2% (11/42; 95%CI: 12.9% - 39.5%) and 14.3% (6/42; 95%CI: 3.7% - 24.9%), respectively. The median OS2 was 7.9 months (95%CI: 4.5 - 11.3 months, Figure 2B). When initial event was defined as BM was first identified, the 1-year, 2-year and 3-year survival rates for ASC patients were38.1% (16/42; 95%CI: 23.4% - 52.8%), 9.5% (4/42; 95%CI: 0.6% - 18.4%) and 4.8% (2/42; 95%CI: 0 - 11.3%), respectively. Survival data for all patients. BM: brain metastasis; TTB: time to brain metastasis; OS1: overall survival 1; OS2: overall survival 2; BM number: S=single; M=multiple. Differentiations: L=low; M=moderate; H=high. BM: Brain metastasis; VEGF: Vascular endothelial growth factor. The results of the univariate survival analysis by the Kaplan-Meier method and multivariate survival analysis by Cox regression for OS1 are shown in Table 2. The results suggested that TTB longer than 12 months (OS1: 38.6 months vs. 7.1 months for TTB less than 6 months; 38.6 months vs. 14.4 months for TTB 6-12 months; P = 0.001), resection for BM lesions (OS1: 19.3 months vs. 11.6 months for those who did not resect BM lesions; P = 0.028), receiving standard chemotherapy (OS1: 15.7 months vs. 7.6 months for those did not receive chemotherapy; P = 0.001), and resection for thoracic lesions (OS1: 18.7 months vs. 7.9 months for those who did not have thoracic surgery; P < 0.001) were all predictors of a longer OS1. However, results of multivariate analysis showed that only TTB and BM resection were independent predictors for a longer OS1 (P-values were 0.002 and 0.020, respectively). For TTB > 12 months, the adjusted hazard ratios (HR) for OS1 were 0.15 (95%CI: 0.05 - 0.48 vs. TTB ≤ 6 months, P = 0.001) and 0.22 (95%CI: 0.07 - 0.71, vs. TTB 6-12 months, P = 0.010; Figure 3A). For BM resection, the adjusted HR for OS1 was 0.47 (95%CI: 0.24 - 0.94 vs. not resected, P = 0.032; Figure 3B). The results of the univariate and multivariate survival analysis for OS2 are shown in Table 3. The analyses revealed that resection for BM lesions (OS2: 17.0 months vs. 4.8 months for those who did not resect BM lesions; P < 0.001), receiving chemotherapy (OS2: 10.3 months vs. 3.3 months for those did not receive chemotherapy; P < 0.001), resection for thoracic lesions (OS2: 10.3 months vs. 4.8 months for those who did not have thoracic surgery; P = 0.025) and having more than 3 treatment cycles for BM (OS2: 15.6 months vs. 4.4 months for having less than 3 treatment cycles for BM; P < 0.001) were all predictors of a longer OS2. However, the results of multivariate analysis showed that only treatment cycles for BM was an independent predictor for a longer OS2 (P = 0.006). For having more than 3 treatment cycles for BM, the adjusted HR for OS2 was 0.41 (95%CI: 0.20 - 0.83 vs. treatment cycles <3, P = 0.013; Figure 3C). Kaplan-Meier curves for overall survival of primary lung adenosquamous carcinoma patients with brain metastasis. (A) The Kaplan-Meier curvefor OS1 of primary lung adenosquamous carcinoma patients with brain metastasis. The median OS1 was 13.8 months (95%CI: 11.2 - 16.4 months). (B) The Kaplan-Meier curve for OS2of primary lung adenosquamous carcinoma patients with brain metastasis. The median OS2 was 7.9 months (95%CI: 4.5 - 11.3 months). OS1: overall survival 1; OS2: overall survival 2. BM: Brain metastasis; OS: Overall survival; VEGF: Vascular endothelial growth factor. Kaplan-Meier curves of factors that independently influence OS1 and OS2. (A) Kaplan-Meier curves for OS1 of patients with TTB longer than 12 months, TTB 6-12 months and TTB ≤ 6 months. TTB longer than 12 months were independent predictors for a longer OS1[adjusted HR: 0.15 (95%CI: 0.05 -0.48 vs. TTB≤ 6 months, P=0.001);0.22 (95%CI: 0.07- 0.71, vs. TTB 6-12 months, P=0.010). (B) Kaplan-Meier curves for OS1 of patients with BM lesions resected and not resected. Resection for BM lesions was an independent predictor for a longer OS2 [adjusted HR: 0.47 (95%CI: 0.24 - 0.94 vs. not resected, P=0.032)]. (C) Kaplan-Meier curves for OS2 of patients with chemotherapy cycles more than 3 and patients with chemotherapy cycle less than 3. Treatment cycles more than 3 was an independent predictor for a longer OS2 [adjusted HR: 0.41 (95%CI: 0.20 - 0.83 vs. treatment cycles <3, P=0.013)]. HR: hazard ratio; OS1: overall survival 1; OS2: overall survival 2; TTB: time to brain metastasis. This study analyzed the survival data in primary lung ASC patients with BM. The results revealed that median time to BM for all patients, including those occurred BM at the time of diagnosis was about 6 months. The OS data were shown according to two different starting events. TTB longer than 12 months and resection for BM lesions were independent predictors for a longer OS1, and treatment cycles more than 3 was an independent predictor for a longer OS2. In clinical experience, patients with BM have a deterioration in performance status (PS) and a very limited survival time . Thus, the appropriate management for NSCLC patients with BM is still an important issue in clinical practice. Lung ASC is an uncommon lung cancer type, accounting for 0.4-4% of all lung tumors. Due to its rarity, ASC patients with BM have received far less attention in clinical practice. We conducted this study as evidence in ASC patients with BM was very limited to date. ASC has been reported to be an extremely aggressive subtype and patients with primary lung ASC had a poorer prognosis compared with those with a pure adenocarcinoma or squamous cell carcinoma subtype [2,7,8]. The aggressive biological behavior of lung ASC can be reflected in our findings: (1) The primary ASC patients with BM collected in this study were predominantly young and occurred tumor with low differentiations; (2) Most patients were diagnosed with an advanced clinical stage (stages IIIB-IV); and (3) The relative short time from diagnosis to occur BM and low survival time regardless of the calculation method of OS. 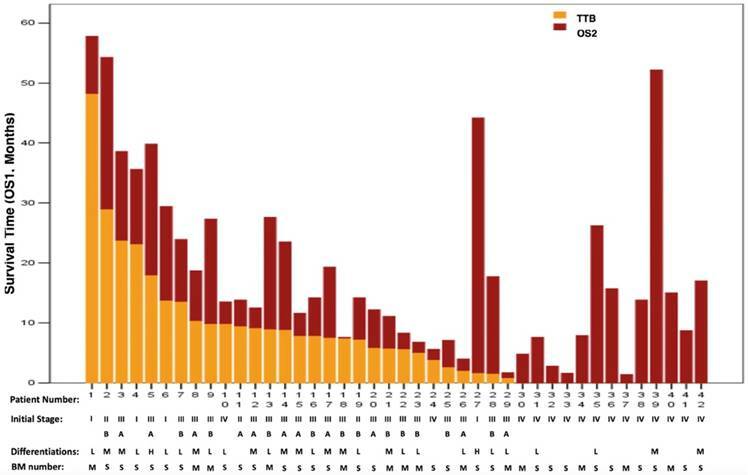 ASC patients are likely to occur BM as the TTB identified from our study was less than 6 months. In addition, 13 patients (31%) was identified BM at the time of ASC diagnosis. The 1-year, 2-year and 3-year survival rates were relative low in ASC patients with BM according to the results, compared to that in unselected ASC patients. We did not calculate the 5-year survival rate in this study as the estimated OS was very low in lung ASC patients with intracranial metastasis. Other studies have reported that the 5-year survival rate for unselected lung ASC patients varied between 6.2% and 25.4% [2,3,7,8,11]. In the multivariate survival analysis, we identified that TTB longer than 12 months and resection for BM lesions were independent predictors for a longer survival when survival data was calculated from the time ASC was diagnosed, and that standard chemotherapy cycles more than 3 was an independent predictor for a longer survival when survival data was calculated from the time BM was identified. Thus, primary lung ASC patients are recommended to have their BM lesions resected if possible when they were identified BM. However, many patients do not have the chance to have their BM lesions removed as they occur multiple BM lesions. For these patients, standard chemotherapy for 4-6 cycles plus whole brain radiotherapy (WBRT) is needed. Other factors may also influence the survival of ASC. Some studies have reported that the percentages of adenocarcinoma and squamous cell carcinoma within the ASC could influence survival [3,8,12,13]. But the authors did not draw consistent conclusions. No statistical significant differences were found according to the percentage of adenocarcinomas component by some studies [3,12]. In contrast to these results, some authors observed that patients with a balanced component within the two ADS histologic types have better prognosis [8,13]. In addition, these studies were conducted in unselected ASC patients, and whether percentages of adenocarcinoma and squamous cell carcinoma could influence the survival of ASC patients with BM remains unknown. The present study has some limitations. Firstly, this was a retrospective study and the sample size was relatively small due to the low incidence of primary lung ASC with BM. Secondly, the representability might be insufficient as it was a single center study. Therefore, the results of this study should be interpreted with caution as they need to be confirmed by subsequent multicenter studies with larger sample sizes. In conclusion, the study analyzed the survival data in primary lung ASC patients with BM. This study shows that resection of BM if possible, and standard chemo-radiotherapy in patients with multiple BM lesions are associated with longer overall survival. This study was supported by the National Nature Science Foundation of China (Grant No. 81472175) and Medical Guidance Project of Shanghai Science and Technology Committee (Grant No. 15411961500).